Occasionally a perfume designer touches my heart in such a way that I cannot help but share her perfume journey with all of my readers. This person is JoAnne Bassett. I've rarely done a full interview with the designers that Noteworthy Fragrances has showcased and I want you to know more about this extremely talented and amazing woman. Before you read this interview, I simply must tell you about my favorite perfume that JoAnne has designed. It is Le Voyage and it is amazing! Le Voyage is truly an unparalleled fragrance offered in eau de toilette or perfume. Each bottle is lovingly blended from rare and precious essential oils to form a harmonious potion. A symphony of exotic flowers and sacred oils marry to create a concerto never before heard. The painstaking method of creation, uses the finest, most expensive ingredients available. This is definitely not a simple linear perfume, but one of great mystery that evolves during the course of wearing. At first glance you might think this fragrance could be almost overpowering, but it is a well mannered, polite and demure accessory that could be worn everywhere from the boardroom to the ballroom. Leaving the office, I'd recommend switching to the perfume and you are ready for a night of dining, dancing and shall we say daring? Le Voyage can be sampled in the eau de toilette version for $2.00. JoAnne combines pink lotus (hydrodistilled essential oil not the absolute), hydrodistilled frankincense from Oman, Bulgarian alba rose otto (white rose oil), East Indian Mysore sandalwood, litsea cubeba, jasmine sambac absolute, ylang ylang, linden blossom absolute (tillea cordata) from France, in organic grape alcohol. The parfum is in organic jojoba oil.The sensuous fusion has a mystical quality with the potential to transform its wearer with a haunting fragrance. 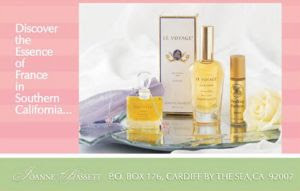 Joanne Bassett offers her fragrances in delightful collections that can be sampled as well. Warning: you'll try one and then want them all. Yes, they are that wonderful. JoAnne also offers one of the best all-inclusive fragrance design kits available, including 39 perfume essences, charts, recipes and all the supplies needed for making your own natural perfumes. Develop your inner perfumestia with this essences kit. So tell me JoAnne, how did you become interested in natural perfumery? I have always been interested in fragrance. As a child I loved to smell all of the flowers in the yard. I loved the lilacs, iris, old fashioned roses, peonies, lily of the valley, apple blossoms, and even the smell of some wild flowers that were unusual. Walking in the woods was a great experience for me as I loved the smell of pine trees. Herbs like dill were used in cooking and canning pickles....and the smell of garlic were perfumes I smelled often. These were the beginning of the natural scents in my mind. As an adult I had my own organic herb and vegetable garden, cutting flower and rose gardens. I began to make potpourri and soap from the materials in my yard. My company Bassett Aromatherapy was started 16 years ago. Traveling to over 40 countries sourcing essential oils and raw materials opened my eyes to a whole new world. Perfume materials that were natural and exotic piqued my interest. As an aromatherapist I was hired to create private label products for stores and spas. This meant designing a natural scent for ambiance for their environment that could be used in an electric diffuser. A natural scent for their product line was also developed to be added to lotions, soap, bath salts, and to fragrance everything else. As a result of this the owner would want a perfume created for them. My natural perfume career began without my calling myself a perfumer. Many clients were having me make custom formulas for emotional or physical ailments. It was just a natural progression that some of these "feel good" formulas contained rose, sandalwood, and some pretty smelling botanical essences. So the small vials and bottles I made and sold were my beginning perfumes. True aromatherapy does not use the absolutes so when I worked with the jasmines and other absolutes I designated them perfumes. That was way back in the early 90's. I still have some of the formulas. My Mother always wore fragrance...Youth Dew was her favorite scent. She layered it ..She would wear powder, lotion, and eau de toilette every day of her life. Everything was scented to soap and bath salts...always. Fresh flowers in the house and herbs in the kitchen. I grew up with scents everywhere and with 4 sisters and a French father with roots to Paris; fragrance is in my blood. I received my first fragrance set from Avon when I was still a child. I was fascinated and began to wear it everyday. What was the compelling force the decision to use 'natural' ingredients in your fragrances? At some point I was not able to wear my Chanel 5 or Coco or some other synthetic commercial fragrances. I would cough, and get an irritated throat, my eyes would tear, and my nose would become plugged. I would have an allergic reaction when I walked through a fragrance department in a store. So after years of wearing the synthetic fragrances made mostly from laboratory chemicals, some essential oils, and DPG I had to stop wearing them. I traveled Europe trying fragrances that were labeled Naturelle to be disappointed to discover they contained synthetic fragrance oils. Becoming weary of natural labels I researched and found that "nature identicals" is only copying the smell of a flower in a laboratory. Then they make the compound from chemicals and call it natural..like the lilac and Lily of the valley we see in stores. Totally synthetic. The naturals have more nuances than the synthetics which are more linear. I began to create my own fragrances from essential oils and raw materials from only naturals. Do you source your ingredients both US and International? Yes I have imported from many countries for Bassett Aromatherapy. India has a wealth of oils and raw materials that are perfect for perfumes. You have several collections...Please tell me about the Royal Collection? I love travelling and have spent as much as 3 months in Europe at a time on fragrant and historical journeys of my own. My father's family (Bassett) is a descendant of Emperor Charlemagne. So being of royal blood I have an interest in the history and the nobles of long ago. There is also royal blood on my Mother's side of the family. The palace of Versailles is one of my most favorite places. I love the gold gilding and the grounds...the style and elegance of the Austrian crystal chandeliers. My memories of the palace came to me one day when I sat down to formulate and Versailles eau de parfum was born. The whole Royal Collection was already alive in my head and I merely had to bring out the paper and start writing down the formulas and placing the oils in the bottles. It was meant to be. The various Royal perfumes represent a number of the fragrance categories. It is very complete. Napoleon is a musky fragrance that is one of my favorites. I also wear it layered with Chantelle and sometimes Versailles. Madame Pompadour contains almost 40 essences so it is very complex. All of my collections are for both women and men. Do you t incture any unusual fruits or flowers for your perfumes? I make tinctures of tuberose, honeysuckle, pittosporum, and some uncommon flowers growing in California that are very unusual, vanilla beans, ambergris, various spices, and gardenia infusions in jojoba oil. I make perfume in the old classic French style with salon strength. Everything is done by hand, macerations, tinctures, infusions, marrying for a month, filtering, hand bottling and labelling. It is a very serious labor of love. What has been the most rewarding achievement you've accomplished in your fragrance journey? Making custom fragrances for both women and men and the wonderful responses I receive from my clients. They love the natural parfums and the French flacons I sell them in. How has being a member of the Natural Perfumer's Guild assisted your progress as a natural perfumer? The Guild has given me more visibility. Companies contact me who want me to design custom signature scents for them and develop a whole line based on my creations. I am happy to offer this service along with consultations for various projects. For almost 2 years I had a natural perfume boutique, Le Bijou in La Jolla. I closed the boutique in March 2007 so I could develop more perfumes and get my lines in high end department stores, boutiques, hotels, spas, and apothecaries. In 2 years I will be a major natural perfume line sold in many fine stores throughout the world. I will continue to make quality a priority and my line will be known for the rare and costly essences used. JoAnne, thank you for spending the afternoon with me and for this lovely interview. Noteworthy Fragrances wishes you the absolute very best in your journey and invites you back again in the future.